SHCA has begun accepting 2019-2020 re-enrollment applications from current Academy families for the upcoming 2019-2020 school year. New student applications for the 2019-2020 school year may be submitted to the school office beginning on Tuesday, February 19, 2019. If you will be relocating to our area, please click here if you would like to have an enrollment packet mailed to you. If you are in the area, we would love to meet you! All families are welcome to attend our annual Open House on April 4, 2019 at 6:30 PM. The Admissions tab above has great information for prospective families. The tabs titled "Admissions Screening" and "Admissions Process" have answers to many commonly asked questions. They also list items required to complete the application process for every new student. Please take time to look over the information and then give us a call if you have further questions. Please click this link "Tuition and Fees" to open the 2019-2020 tuition and fees rate sheet. Spring Hill Christian Academy is honored to have been voted the Gold Winner Best of Hernando Private School for the third time! Thank you to all of the parents, students, faculty and staff that work together to make this a truly unique educational family! 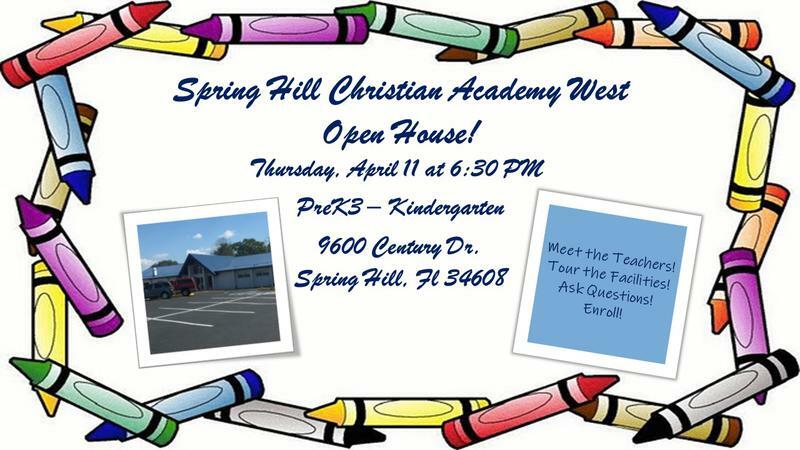 Spring Hill Christian Academy was established as a ministry of Spring Hill Baptist Church in the fall of 1996 with the goal of providing a Christ centered education for those students who attend. As a private Christian School we seek to provide a quality education on a solid foundation of faith and academics. We are members of the Florida Association of Christian Colleges and Schools and the Suncoast Christian Athletic Conference. Please review our entire website and prayerfully consider Spring Hill Christian Academy for your child's educational needs. If you would like more information please click here to have an admissions counselor contact you. Spring Hill Christian Academy Office hours are 7:30am to 3:30pm Monday through Friday. Please feel free to e-mail us outside of our office hours at shca@springhillca.com. We will be glad to answer any questions or concerns via an email reply or a phone call as needed. We will reply to the emails at our first opportunity. SHCA Second Semester: Welcome back staff and students! 2019 promises to be a great year at Spring Hill Christian Academy! SHCA West Campus Open House: Come see the renovations and learn more about SHCA! Thursday, April 11 at 6:30 PM. 9600 Century Dr. in Spring Hill. For families needing to place an order for New uniform tops and jackets - uniform order forms are located in the literature rack next to the SHCA school office window. Families needing sizing assistance should please kindly call ahead and make an appointment to try on clothes. We are happy to help! Communication with our parents is done primarily through e-mail. Please verify that we have an accurate e-mail address for you and that we are not being filtered into your spam folder.